An incomplete copper alloy bracteate of probable post-medieval date (c. AD 1550 - 1700). 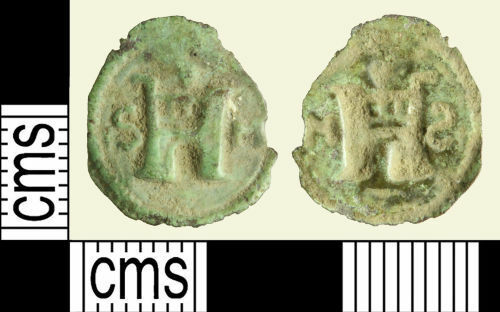 The bracteate is ovular in shape with an impressed design of a stylised castle with a crown in the centre flanked by the initials S and M surrounded by a pellet border. The bracteate measures 14.69mm in diameter, is 0.71mm thick and weighs 0.23g.